When you took over power, it was uncomfortable. When you fired skilled workers in civic service, it was unreasonable. When you introduced Sharia law, it was painful. When your regime announced war against South Sudan, I feared for my family and friends. But now, after 23 years under your governance; after 23 years of discriminating, forcing, abusing and killing; now, it is personal. Here I am in London watching the uprisings in Sudan exploding all around our country. People are fed up of seeking permission from your government just to survive. We were already struggling with your authoritarian system and restrictive laws, but the recent dramatic increase in the cost of living and fuel prices has pushed our country to the brink. We are angry and have reached the point of no return. Nothing is going to shut us up; we will not back down. Following the uprisings in the Middle East and North Africa, the Sudanese people are now speaking out and protesting in cities across the country, from Khartoum and Eljazeera to Portsudan and Gadarif. Women, children, students, workers – the whole nation is out on our streets. We are calling for change and for you and your regime to step down. Don’t think that you can get away with arresting and torturing hundreds of thousands of our citizens. We have been watching in horror for the past two weeks. We may see some of these people again after they have been tortured; some we might never hear of again. Sadly, here in London, there is little mention of the protests on the news or in the papers. It seems that a few hundred dead and thousands arrested cannot compete with the death record of Syria or Afghanistan. Don’t worry, Mr President, we will soon have a record of the numbers of dead for the media to pay attention to! Before today, I never took the crimes of your regime personally, although I have been subjected to discrimination as a woman, an atheist and an activist. But four days ago, I was devastated when I got word that six of my university classmates had been arrested. Five years ago at the University of Khartoum, I was friends with Amro Azhari, Fayiz Abdullah, Haj Ahmed, Kifah Osman, Fahad Mohamed and dear Mohamed Salah. Now they have all been arrested. No-one knows where they are or what’s going to happen to them. So now it is personal, Mr al-Bashir. Very personal. And you should be very worried, because we have an entire country of individuals just like me who are taking this personally. It is not only my friends who are threatened by your regime: there are hundreds of our brothers, sisters, mothers, fathers, cousins and friends who must be let free. I cannot imagine what it is like in your prisons or Biut alashbah [torturing/ghost houses].There are few people who have lived to tell their stories, but Waiel Taha and Naglaa Sid-Ahmed’s recent stories are among the most terrifying. Your regime’s crimes continue to pile up: the case of Safia Ishag caught many people’s attention as she was arrested and gang-raped by three of your police officers. Safia is now somewhere outside of the country, having been threatened for pursuing her case. Unfortunately, the situation may be repeating itself. Three days ago, two feminist and human right activists (Kareema Fatih-Alrahman and Sarah Daif-Allah) were arrested while protesting. Nothing is clear yet because your officers will not allow visitors or give the women access to lawyers. From what we have seen from similar situations in the past, my guess is that the least they will be subjected to is sexual assault; I won’t allow myself to imagine what else could happen. 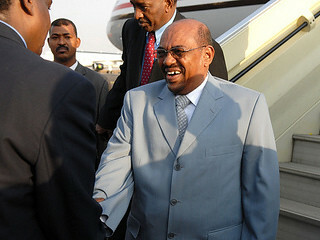 Mr al-Bashir, what you have done to our country is deplorable. It breaks my heart to see this happening. But if you look around you at the protests and the actions of my fellow citizens, you will understand that these are more than angry, hungry, hopeless people causing problems on the streets. We want our children to have access to education, women to gain equal rights as men, rural areas to retrieve healthcare and everyone to have a home in Sudan. We want change, we want real change. Finally, as a Sudanese, an activist and a human, I will join with my fellow citizens to use every available platform to push you out of power and change your regime. I call on every individual in the Sudanese diaspora in London and the world to act. I call on the international community to help and support the Sudanese nation to overthrow your authoritarian government and to achieve civic and democratic change. Mr President, now it’s personal for the Sudanese people. Your regime’s time is coming to an end. Nahla Mahmoud is an environmentalist and human right activist originally from Sudan. She works with a few campaigns in the UK including One Law for All and Secular Middle East and North Africa. She leads the Sudanese Humanists Group. This letter was previously published on the Young Professionals in Human Rights website. Nahla Mahmoud is an environmentalist and human right activist originally from Sudan.